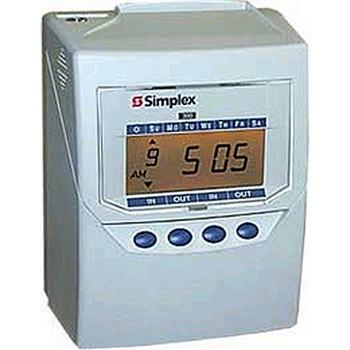 The Simplex 300 automatic time recorder offer Retail and manufacturing companies, service and hospitality businesses, healthcare facilities, and schools a faster, easier way to keep track of staff time. With the Simplex 300, employees can punch in or out in seconds and immediately view their recorded hours. Employees simply insert their time cards into the top of the clock. There is no need to align the card, press special combinations of buttons, or make adjustments for punches in the wrong location. Time cards are automatically punched in a clear and legible manner and an asterisk highlights any exceptions from the expected work schedule. This makes it easy for employees to use and for management to calculate hours worked. Set up is quick and easy as the is no complex PC programming or special wiring required. With a choice of three programmable pay periods and flexible options for column displays and print format, the Simplex 300 is an economical and efficient choice for businesses with 100 or fewer employees. Simplex offers a one-year manufacturer's limited warranty. Warranty does not include consumable parts. With few exceptions, all are return to depot for service. User must pay for shipping to depot. Repaired products will be returned with shipping charges prepaid.